My boy Fergus has been an only child for nearly 7 years. He is my constant companion through the good and bad. He has a really relaxed nature and is very well behaved. About a year ago I started thinking it would be nice to give him a sister, someone to keep him company during the day. But I put it off due to the thought of doing puppy training again. Life was also pretty easy; Fergus had his routine – walked by thedog walker during the day, Uncle Bill in South Yarra, you name it he was sorted. As long as he was fed he was happy. So life took a big change about a week ago – because along came little Quirky! 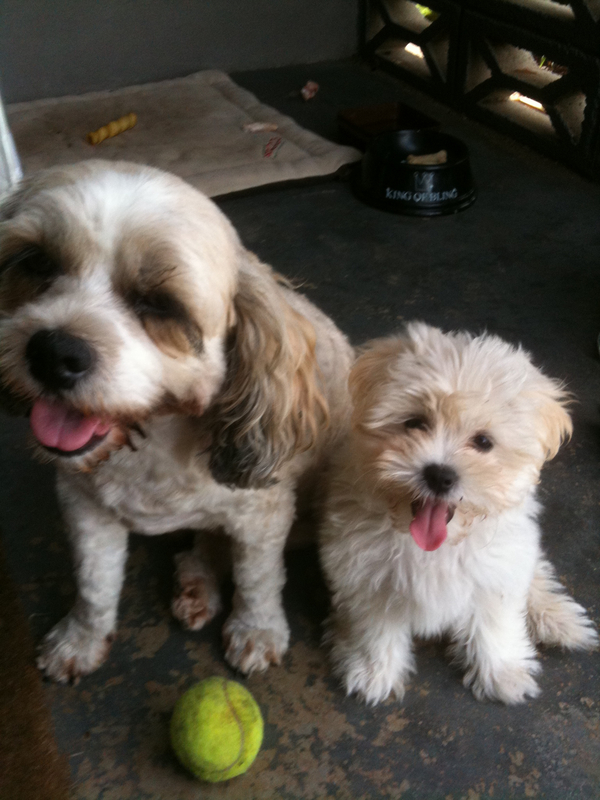 She was born 17/12/10, her mother is a poodle shitzu and her father a Maltese. So she’s very cute! Quirky Guy decided to help out in the finding of Quirky. He soon discovered the asking price for a new pup was nearly $1000! So being him he needed to find a bargain. He searched all night and says to me the next morning, “Have a look at the pup on the screen and see if you like her”. Well, I loved her immediately. She was born in a litter of 6 and was a champagne colour and looked like trouble. I waited until a respectable hour on a Saturday and phoned to see if she was still for sale, only to find she had been sold. However the lady took my details and said would ring if anything changed. So you guessed it, 5 hours later she rang and said we could have her! So off we went to pick her up. She was always going to be named after the business. But much to everyone’s horror, Quirky Guy wanted to call her Squirt! So she is now Quirky aka Squirt. From the moment she arrived Fergus was totally scared and not interested. He went from a house-bound dog to an outside and upstairs dog. So he started acting up. My baby boy was being a little bugger, plus it upset me he wasn’t happy. It has been 2 weeks, and Quirky has grown. Fergus and Quirky can be in the same room, however Quirky is a mad biter so once she starts on Ferg she get the growl and then she starts crying. Sounds the same as 2 kids – not that different at all! We are now going through the toilet training and no biting stage with Quirky and Fergus is getting used to all types of movements, eg. his things being shared and someone wanting to play and he is trying to get Quirky to stay away from his bed. I love my new addition and hope that my boy will come to love her too.